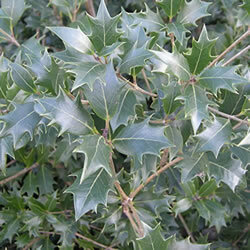 A dense rounded shrub with holly-like, glossy, dark green leaves and clusters of fragrant tubular white flowers. Max Height: 2m. Max Spread: 2m. Flowers September to November. Fruits: November. Full sun/partial shade. Frost hardy. Back-fill with soil mixed with peat substitute and a suitable fertiliser.